Signal mast arm finally sets sail! Remember early August, when a mast arm set sail for 6th and Seneca? On August 6, crews did install a new signal pole, but lifting up the mast arm had to wait. To make room to lift and place the 35-feet-long steel mast arm, the team needs extra clearance. That’s why this time around, on Saturday, Metro trolley lines will be temporarily deactivated at the 6th and Seneca intersection. Steel mast arm signal poles, like those at 2nd and University downtown, can double the life expectancy of signal equipment. They also decrease maintenance needed after wind storms (assuming actual sails are’t attached to these masts). Installation of mast arm to new signal pole and removal of old signal pole at the NE corner of 6th Ave and Seneca St.
Intersection is expected to reopen after 1 PM, with possible temporary lane restrictions as work wraps up. Uniformed police officers will be on site to help direct traffic. 6th Ave between Seneca St and University St.
Seneca St. right turn only lane. Seneca off-ramp reduced to one lane. Vehicles exiting off-ramp may only go down Seneca. 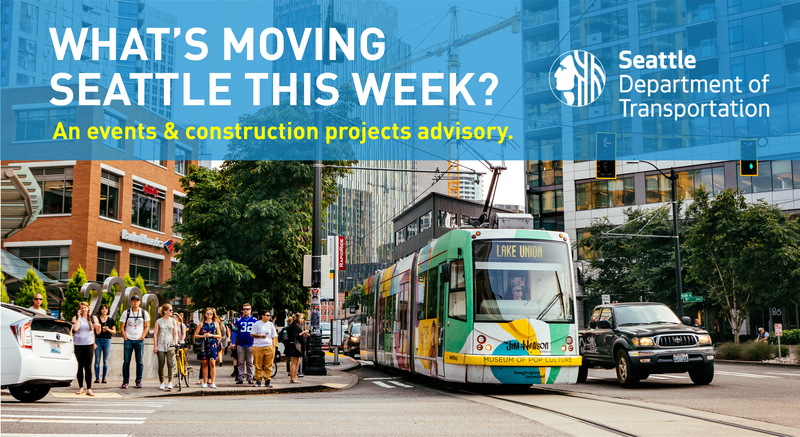 Email 6thAvePaving@seattle.gov or call the project voicemail line at (206) 727-3669. Visit the 6th Ave Paving web site for more project information. Image by Google Maps | Intersection of Broadway and Boren Ave. This weekend, SDOT’s Urban Forestry team will do maintenance and pruning work in the First Hill Streetcar Corridor. On Saturday, crews will inspect and complete irrigation maintenance at Broadway and Boren Ave, and at Broadway and Marion St. Image by Google Maps | Intersection of Broadway and Marion St.
On Sunday, a small crew will weed, mulch and prune in the larger First Hill Streetcar Corridor landscapes, starting on Broadway. Closure | On Sunday, there may be a short period of time where we need to close a NB lane of Boren Ave, between Broadway and E Terrace St. This maintenance work should not directly impact the track areas of the streetcar.